This book was inspired by the events surrounding the closing and reconfiguring of the old San Francisco Public Library in the Civic Center. 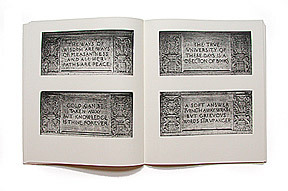 There is a photograph of every inscription in the library. These inscriptions are of more than local value. Their international significance lies in their direct link with libraries in Paris, Boston, and Detroit, inscriptions in general, and the noble history of the public library. Dennis Letbetter also photographed the three other libraries in the United States and France. 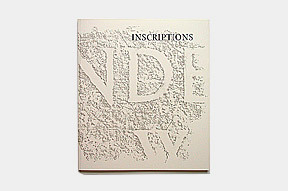 Essays by four internationally recognized writers and artists place the inscriptions in context, historically, technically, aesthetically and architecturally: Historian Grey Brechin, noted British stone cutter Michael Harvey, the influential type designer Sumner Stone as well as Leon Battista Alberti. 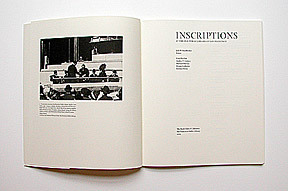 Edited and designed by Jack W. Stauffacher, the book is printed in an edition of 1000 copies. The type is set in Cycles, designed by Sumner Stone and printed by Charles Graphics Inc. on 100# Mohawk Superfine Smooth Soft White Text paper. Bound in paper cover by the Cardoza James Binding Company, San Francisco. The book consists of 80 pages, measuring 9.5 x 11 inches, with 68 duotone photographs.